Movie Review - 'The Girl With The Dragon Tattoo' - From David Fincher, A Classier Thrill Ride David Fincher's English-language The Girl with the Dragon Tattoo is less a reinterpretation than a reiteration — a classier, more expensive version of the lurid Swedish film that came before it. Maybe they should have called it The Girl with the Dragon Tat. That would have signified how much David Fincher's adaptation of Stieg Larsson's thriller differs from the 2009 Swedish version. Which is, not much at all. The Hollywood remake is, of course, in English, and scripter Steven Zaillian has altered some of the details, or simply taken different ones from the novel. And Fincher, having struggled with dramatizing computer use in The Social Network, shows less of dragon-inked hacker Lisbeth Salander (Rooney Mara) at the keyboard and on the Net. Otherwise, though, Fincher's The Girl with the Dragon Tattoo is less a reinterpretation than a reiteration. Watching this stylish but ever so slightly boring movie, viewers may wish the filmmakers had done something to outrage the book's bazillion fans. Move it to Scotland, perhaps, or lose the romance between the bisexual Lisbeth and her crime-fighting partner, the polyamorously hetero Mikael Blomkvist (Daniel Craig). As everyone with an interest in this movie already knows, Mikael is a crusading Stockholm journalist who just lost a libel suit brought by a malignant businessman. He decides to exit Millennium, the muckraking journal he runs with his (married) lover, Erika (Robin Wright). Then Mikael is offered a healthy stipend to investigate a stone-cold missing-persons case. Elderly industrialist Henrik Vanger (Christopher Plummer) has wondered about his favorite niece, Harriet, since she vanished in 1966. He's convinced that the girl, then 16, was murdered, probably by a member of the generally loathsome Vanger clan. These include Martin (Stellan Skarsgard), the brother of the missing Harriet, and Anita (Joely Richardson), one of the few Vangers who doesn't live on a private island in frosty northern Sweden. Mikael was vetted for the gig by unconventional sleuth Lisbeth, a pierced and tattooed goth girl who investigates people by hacking their computers. (Not their phones — the story occurs before the smartphone era.) Lisbeth and Mikael connect in a different way than in the Swedish movie, but their collaboration is otherwise familiar. Lisbeth, a part-time feminist avenger, is intrigued by what turns out to be Mikael's quest: identifying a serial killer whose female victims were murdered to Old Testament specifications. 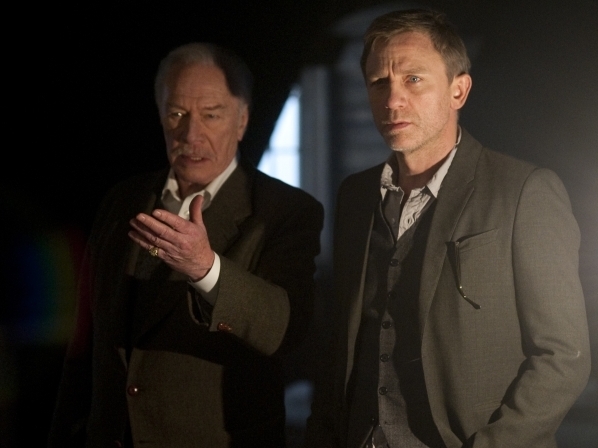 Henrik Vanger (Christopher Plummer, left) offers Mikael Blomkvist (Daniel Craig) a big paycheck to crack the mystery of his missing granddaughter. This part of the sprawling plot is basically Angels and Demons with Nazis, and Fincher doesn't seem especially committed to it. He includes the gruesome homicides, their Biblical connections and Larsson's link between today's rightists and yesterday's fascists and anti-Semites. But the film doesn't spend any more time on this silliness than needed to uphold the original plot. Much more immediate is Lisbeth's battle against corrupt male authority, personified by her legal guardian. For reasons that most viewers will already know, the 23-year-old hacker is still a ward of the state. When her chubby new custodian (Yorick van Wageningen) sexually abuses her, Lisbeth takes violent and elaborate revenge. By comparison, her eventual showdown with a villainous Vanger is anticlimactic. The Americanized Girl with the Dragon Tattoo looks and sounds great. It's shot in wintry tones, and driven by composers Trent Reznor and Atticus Ross' pulses, drones and thumps, which add tension to stretches of dry exposition. But the movie's classiness actually works against it. The Swedish version was sloppier and trashier, which suited the material. If that movie was more lurid, it also packed more genuine emotion. Mara and Craig embody their characters with assurance and precision, but they — like the movie they're in — are a bit too cold, a little too clean. For a sleazefest like this to work, everyone needs to get into the muck.